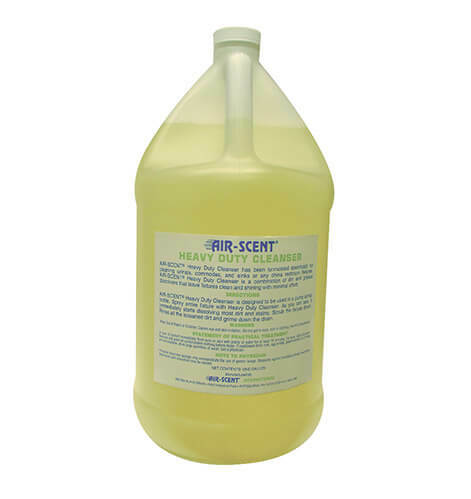 Our Air-Scent® heavy duty cleaner contains a unique combination of dirt and grease dissolvers and has been formulated specifically for cleaning urinals, commodes, sinks or any china restroom fixtures, leaving fixtures clean and shining with minimal effort. If you’re a business owner, restroom hygiene route service operator or a supplier of air care and cleaning products and you’re not keeping a hygienically clean commercial restroom, you’re most likely suffering from poor repeat business, decreased bottom line or poor online reviews. Research and statistics show that customers fear poorly maintained restrooms. Our cleaners, odor neutralizers and air freshening systems are some of the most used and most effective in the industry. Designed to be used in a pump spray. Spray entire fixture with Heavy Duty Cleanser. As you will see, it will immediately start dissolving dirt and stains. Scrub the picture down. Rinse all loosened dirt and grime down the drain. Net Contents: One Gallon; 4 Gallons Per Case. It’s easy. Just send us a message with your specific details, contact information and location and we’ll get right back to you. In the meantime, explore our blog and read up on the many reasons representing Air-Scent products has become a leading global business opportunity for men, women, retirees and existing air care supplying companies.